The Adweek Network is made up of six industry-leading, continuously-updated websites covering the inner workings of the media industry aimed at media and advertising professionals. The blogs cover the key verticals from social media to TV news; from advertising to PR; book and web publishing, newspapers, magazines, radio and digital. 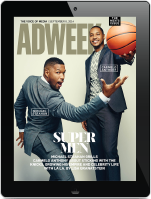 The Adweek Network has the same layout as Adweek.com with a top and lower 728×90 and a top and lower 300×250. Each of the blogs can be individually targeted, or for a broader reach, a Run of Network is available. Adweek Network supports each of the blogs with its own Newsletter, along with the Morning Media Newsfeed. The Newsletters have a similar layout to the blogs and use the same banner sizes (300×250 and 728×90) which enable a combination program. Adweek Network also offers Sponsored Content opportunities with custom content from the advertiser allowing you to reach your customer with a tailored message to generate leads. Many Colleges and Universities find the Adweek Network works well for lead generation. We have a unique .EDU program that supports these efforts. Please contact rob.eisenhardt@adweek.com with your .EDU email address for more information on this program.